Description: Raife pairs a unique architectural form with a two-tiered drum styled lens. Divinity Ivory Idalight is featured on the outer diffuser while the inner cylinder reveals White Iridescent art glass. 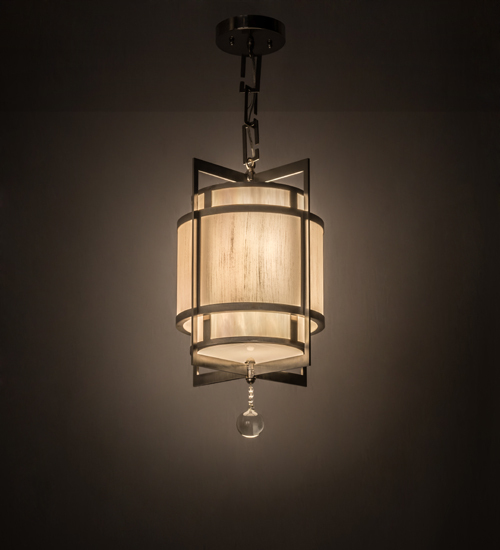 The pendant is enhanced with a frame, accents and hardware featured in a Brushed Stainless Steel finish accented with a Crystal orb finial. This pendant features hand detailed American craftsmanship perfected by years of time-honored artistry, passed down from generations of artisans. This lustrous fixture is offered in custom styles, sizes and colors, as well as dimmable energy efficient lamping options such as LED. The fixture is UL and cUL listed for damp and dry locations.